Behold & Reflect: Asking Myself: In what activities do you feel blocked from God's presence in your life? 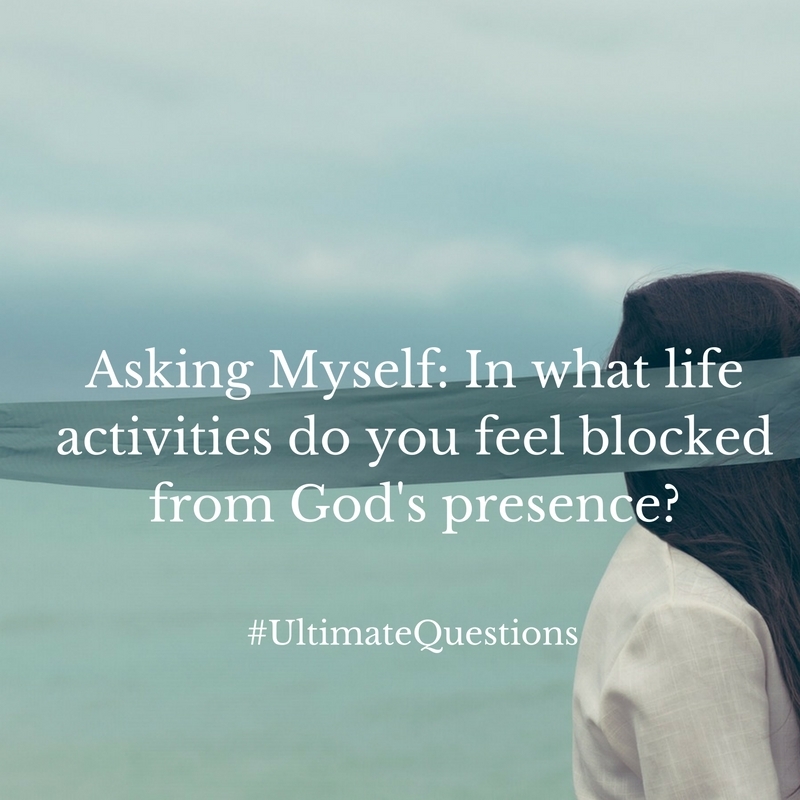 Asking Myself: In what activities do you feel blocked from God's presence in your life? This is the 29th post in my series "Asking Myself," in which I weekly ponder one question posed in Teresa Blythe's rich book, 50 Ways to Pray. You can find the start of the series here and last week's post here. The first nine posts focused on theological musings, while posts 10 to 25 prayerfully consider the specific questions Jesus posed in the New Testament. Posts 26 to present focus on Questions on Spirituality. Q: In what activities do you feel blocked from God's presence? Well. I hate to say it, but I often feel blocked from God's presence. Perhaps this isn't as bad a thing as it seems at first religious glance. After all, it's better to feel blocked, than to be completely unaware of it. Hopefully that dry, dismal feeling is the impetus I need to seek him out or to assess how actions and frame of mind might be contributing to the distance. Yet it's hard for me to single out specific activities that unilaterally hide his face. I supposed the safe answer would be: I'm blocked when I'm sinning. Yet, sometimes sin triggers the conscience alarm that makes me most aware of of the Almighty. So what actually blocks me from God? My off-the-cuff answer produced these three activities that I find to be fairly sure-fire ways (for me) to be blocked from the joy, peace, love and creative energy that come from God's presence. 1. Spending any more than 5 consecutive minutes on social media. Especially in our polarized political and cultural climate, any amount of time spent skimming through or clicking within my various feeds makes me prone to the habit of outrage so many articles and posts seem crafted to inflame. These days, I find that doing anything more than "liking" a few of my friends' kid pics leads to being sucked into the world of injustice and idiocy. More than feeling my blood boil, I feel the urge to retaliate, to set the record straight. The impulse is checked only by the observation that most of the opinions expressed on social media are fixed. Facebook is not (for me) a place of humble reflection nor an open marketplace of ideas where people feel safe enough to consider another perspective. Jesus did act on his righteous anger over the money changers in the Temple, but I don't think he purposely fed his indignation by returning over and over again to turn tables. 2. Spending too much time staring into the mirror or my closet. Can I just say I think the endless churning of the machine that is the fashion industry is stupid? One of the reasons I loved visiting Germany was that I got to wear the same pair of jeans every. single. day. This was actually because I packed shorts for August weather and it was about 50 degrees and raining most days. But no one was the wiser to my fashion faux pas. In fact, the locals often wore the same outfit two days in a row without a trace of shame. I have no idea why Americans feel the need to cram their closets full to bursting and have a fresh outfit for every day of the month... or year if you're a female newscaster. God bless those poor women! Sorry for the rant. As you can see, even writing about this issue obscures the smiling face of the Father for me. 3. Comparing myself to another person. In the same vein of insecurity as fussing too much over my physical appearance, I struggle with comparing myself to others. My achievements, my personality, my parenting prowess, my (lack of) housekeeping skills, my abilities, and my seeming potential in life. To be aware of how deeply loved I am by God should also mean feeling deeply secure in the fact that He sees in me deep worth. Just as I am. As my awesome friend says to me and no doubt many people, "You're God's favorite." She's not being insincere... and neither is God. He sees us all as His personal favorite. Just as we are. Those three are the activities that immediately come to mind when I think of life's low-points. Please note this is not my prescription for things other people should avoid. I know plenty of people who lead vibrant God-focused ministries on Facebook and provide a light to crowds of unsuspecting feed-readers. Some people also find a true creative outlet in fashion and cosmetics. As a journalist, I've interviewed someone who felt it was her God-given calling, as a sought-after makeup artist, to help women feel and look their best. Who am I to judge? Number three is a little bit more cut-and-dry, though I still can't say that it is universally a bad idea to consider the good (or bad) examples of those around us. By being aware of and opening ourselves to the virtues of others, we might be inspired to discipline ourselves in new ways for our spiritual formation and character building. Even noting others' splinter-sized vices might be an opportunity if we're seeing a mini mirror image of our own "logs." So, what are the activities that tend to black out God's presence in your experience? Are they as gray and fuzzy as my own, or more black and white? Next week: Who was God for you when you were a child?